Liv Yang Bin, an ethnic Vietnamese living in the sprawling Cambodian capital of Phnom Penh, grew up speaking, thinking and dreaming in Khmer, the official language of Cambodia. However, like the generations before him, Liv and the rest of his family are prohibited from holding citizenship, thus denying them access to the most basic of rights. Although all five of his children were born in Cambodia, they are unable to receive Cambodian birth certificates on account of their Vietnamese background. Without these documents, his children cannot continue their education beyond primary school. Liv’s fate is shared by thousands of ethnic Vietnamese residing in Cambodia. While their Khmer countrymen own land and have access to higher education, most of Cambodia’s Vietnamese minority live in rural slums, where they rely on meager earnings from fishing to sustain themselves. Many ethnic Vietnamese must endure this discrimination because of an anti-Vietnamese sentiment that has deep roots in the unstable and acrimonious history of the neighboring countries of Cambodia and Vietnam. In the 1620s, Vietnamese settlers pushed into the Mekong Delta, an area then-controlled by the Khmer kings of Cambodia. In the decades that followed, their numbers swelled and eventually supplanted the Khmer presence in the region. A long period of Vietnamese imperialism that saw the perennial colonization and political subjugation of Cambodia by the Vietnamese followed. This exacerbated anti-Vietnamese sentiment among Cambodia’s Khmer majority, with things reaching a tipping point in the 1840s when a series of bloody Khmer uprisings occurred. The period of French colonization from the 19th to mid-20th centuries further intensified anti-Vietnamese sentiments among Khmers. On one hand, French colonial rulers saw Vietnam as a “jewel” with rich agricultural regions that could be harnessed by what they called the “industrious” Vietnamese. On the other hand, they viewed Cambodia as a nation filled with “lazy and incompetent” individuals whose only use was to be absorbed into the economic and industrial growth of its rival nation. To make matters worse, French colonization policy encouraged Vietnamese migration to Cambodia. Their numbers swelled from a mere 5,000 in 1874 to approximately 250,000 in 1951. Naturally, ethnic Khmers viewed the influx of Vietnamese as a threat to their cultural independence. Following Cambodia decolonization and declaration of independence, a coup d’etat brought General Lon Nol to power. Lon Nol stirred nationalist sentiment by using anti-Vietnamese ideology to affirm his legitimacy, launching a series of violent pogroms that caused more than 100,000 Vietnamese to flee the country. In the 1970s, anti-Vietnamese sentiment peaked under the infamous Khmer Rouge regime. The Khmer militia expelled as many as 150,000 Vietnamese and massacred those who remained, including children of mixed Khmer-Vietnamese families. Vietnam responded to the brutal treatment of Vietnamese in Cambodia with a large invasion in 1978 that forced out the Khmer Rouge and replaced it with the pro-Vietnamese People’s Republic of Kampuchea, marking the beginning of a decade-long military occupation by the Vietnamese. The Vietnamese-backed government attempted with little success in restoring the political and economic state of Cambodia. During this time, many Vietnamese who fled during the Lon Nol and Khmer Rouge regimes returned to Cambodia. In years to come, the United Nations attempted to oversee the political restructuring of Cambodia, but saw little progress in reconciling Khmer hatred towards the ethnic Vietnamese. Attempts towards a peace agreement with the remaining Khmer Rouge rebels met with failure. Meanwhile, driven in part by the Vietnamese invasion and occupation, antipathy and fear towards the Vietnamese minority continued to grow and exist to the current day. The Cambodian political system rarely saw stability through the years because of imperialism and domestic conflicts. But one thing that was consistent through its chaotic history was the harboring of anti-Vietnamese sentiment, which culminated in the passage of strict naturalization laws in the 1950s. These laws purposefully failed to define what a Khmer citizen is in order to prevent ethnic Vietnamese from becoming naturalized and obtaining basic political rights such as voting. Racial discrimination was especially apparent during the national election last July. Ethnic Vietnamese who attempted to vote or simply demonstrate a political voice were actively stopped by Khmers at polling stations. Security forces brutally used water cannons, physical violence and even firearms as means of prevention and regulation. I witnessed such blatant disregard for basic rights. As my tour bus made its way through the Phnom Penh city center, I hear the word yuon screamed at a group of ethnic Vietnamese. Khmers used this discriminatory term to pester and threaten the ethnic Vietnamese at the polling stations. From what I observed, many chose not to exert their voting privileges out of fear of violent or even fatal reprisal. 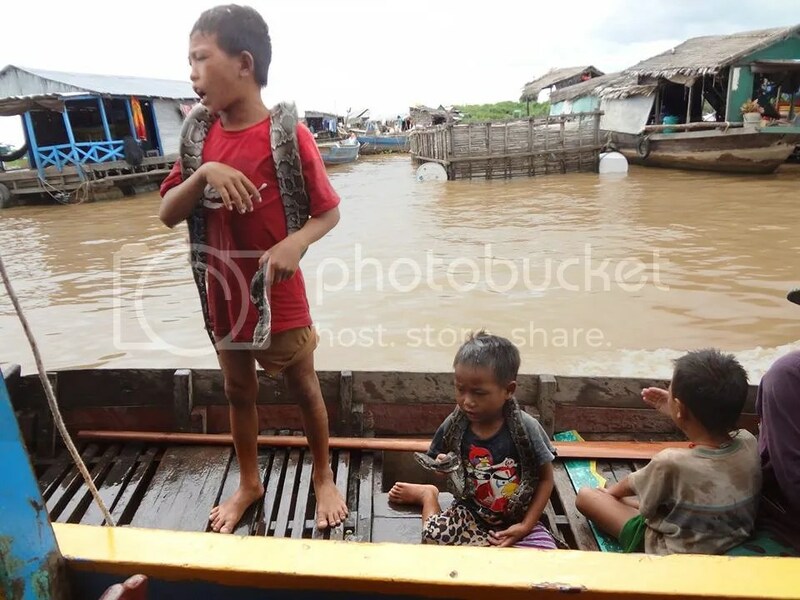 Elsewhere in the city of Siem Reap, I stumbled upon a floating boat village inhabited by Vietnamese families, most of whom lived in shoddy shacks kept afloat by oil barrels. The children were scarcely clothed. Aside from begging from tourists, the villagers relied on fishing as the main means of everyday survival. Ha, a single mother of two told me that her two sons were not allowed to receive any education. She said that it is a right limited to the nguoi Kampuchea, or Khmers. Despite being born in Cambodia, they could not be truly “Cambodian.” The authorities denied the children their birth certificates on the basis of their hereditary background. Like Liv Yang Bin, this mother and those around her have probably lived in the village for generations. But because their external features identify them as Vietnamese, they are barred from receiving basic civil rights. So what can be done to resolve this issue? One solution floated by the Cambodian government calls for a law implementing selective deportation of illegal ethnic Vietnamese residents. However, the guidelines for such a process are murky as it is nearly impossible to determine whether or not an ethnic Vietnamese entered Cambodia illegally. Historically the Vietnamese migration into Cambodia has been continuous, arbitrary and unrecorded. Instead, Cambodia should pass a nationality law. Such a law should follow the precedent set by relevant legal documents such as the Paris Peace Accords. Although the Accords were created to resolve the conflict between the Khmer Rouge and the Cambodia government and assist in removing Vietnamese troops from the country, they also contained a clause that emphasized the restoration and protection of human rights as written in the United Nations Universal Declaration on Human Rights. In context, the Accords provided that all Cambodians, including refugees and “internally displaced persons,” are entitled to live in comfort and personal security. However, there is a grey area in the Accords that fails to specifically delineate who is a Cambodian. As a consequence, the qualifications for receiving Cambodian citizenship and by extension, basic rights, are unspecified. In addition, the Cambodian Constitution contains a clause that outlines the government’s commitment to guarantee human rights for all Cambodian citizens regardless of their race, color and any other status. However, just like the Paris Peace Accords, the constitution fails to explicitly define the qualifications of Cambodian citizenship. Explicitly defining these qualifications are the first step to empowering disadvantaged minorities in Cambodia. Cambodia has a legal obligation to enact a non-discriminatory nationality law. It would fulfill the constitution’s guarantee of Cambodian citizenship for people of various races and ethnic groups. If Cambodia takes this progressive move towards developing a non-discriminatory law one day, we will not only see improving conditions for ethnic Vietnamese, but also better relations between the two rival countries of Vietnam and Cambodia. I hope to return to Cambodia one day to find Ha and her children living a better lifestyle secured through the guarantee of their fundamental rights. Youn is the term Khmer people identify the people of VN descent as. It was never a problem till the 2013 election when unauthorized Youn tried to vote and the people got fed up with it. Word been alive for generations. It is never meant as an insult asked any Khmer people that. Youn get better treatment in Cambodia than Khmer get in VN believe it or not. The VN puppet running the country even refer to his masters in Hanoi as Youn (Vietnamese) people.